It’s a well-worn statement but there really is nothing that can prepare you for your first encounter with India and more specifically Calcutta. The colours, aromas, heat and sheer weight of people are simply overwhelming. Bright yellow taxis, the lines of colourful washing hanging up in the streets, the colours of the ladies Sarees, the uniquely painted lorry designs all compete for your attention. Lines of men take turns to wash on the curb side whilst street food vendors jostle to sell their mixture of sugar beet juice, fruit and vegetables. Add to that the never ending line of rickshaws, historic buildings and men and boys pulling very heavy carts in the place of horses and you have a concoction that simply overloads the senses. This mass of humanity is breath taking, challenging and wonderful all at the same time. Then you happen upon a little oasis of calm in the form of a beautiful and tranquil temple. Before you know it you’ve swapped one extreme for another as you stroll around in sedate wonder taking in the vibrant colours and ornaments that adorn the multitude of holy buildings. 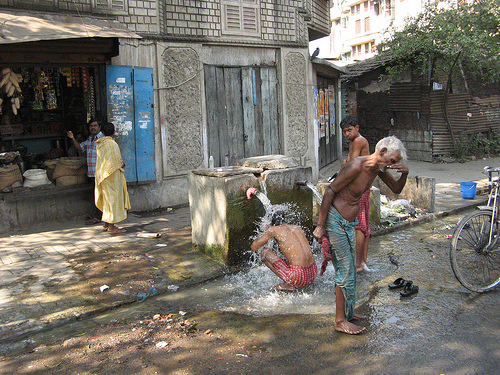 My jumping off point for my trip to the Darjeeling Himalayan Railway was Calcutta. By chance I timed my arrival for the start of a religious festival celebrating Saraswati, the Goddess of knowledge. The streets were packed full of replica clay models of the Goddess which were being bought in vast quantities by Hindu families to take home and decorate. By the end of the festival these same clay models are taken down to the Hooghly River, which is a tributary of the Ganges (the holy river), and released to drift away before dissolving back into the water from whence they came. Unfortunately I was not going to be around to witness this spectacle for I had a train to catch on day two of my visit and so made do with wandering the streets, taking in the myriad sights, smells and sounds of this tumultuous city. After making my way to the main Calcutta Howrah interchange on day three of my trip I was taken aback, despite being pre-warned, by the sheer number of people who call the station home. The platforms and sidings were lined with sleeping bodies in every available space. It was a difficult sight to take in especially with so many children amongst the rough sleepers. I got on a crowded train heading to New Jalpaiguri and sat staring out the window reflecting on the station scene. One of the joys of Indian rail travel is sitting in a door way watching a continuing colourful panorama of the country at work passing by but on this occasion my mind was processing what I had witnessed. Maybe it’s my Western sensitivities and guilt but I resolved to look into the work of the railway children charity on my return. The Darjeeling steam train is fondly known as the toy train and for good reason (just look at the pictures!). 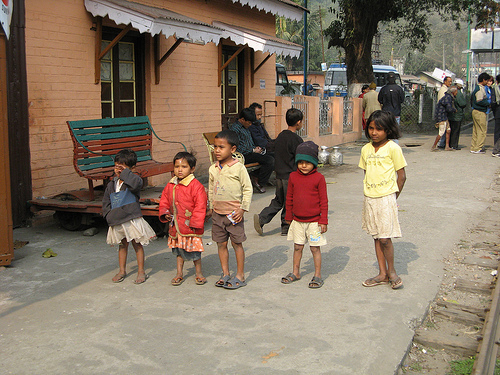 On arriving at New Jalpaiguri I caught a bus to Siliguri and the start of the Darjeeling Himalayan Railway. After a few minutes getting settled the train slowly moved out of the station and journeyed through the Siliguri bazaar, which is virtually on the track for a few hundred metres, before starting to climb through the mountain forests to Tindharia. This picturesque village, situated in a clearing of the forest, was full of smiling children who welcomed us with trays of food. They playfully jostled to be in pictures and shrieked with laughter with every picture I showed them. I wondered round with my new found friends for a good few hours before I was called back to the train and Siliguri for one more night. 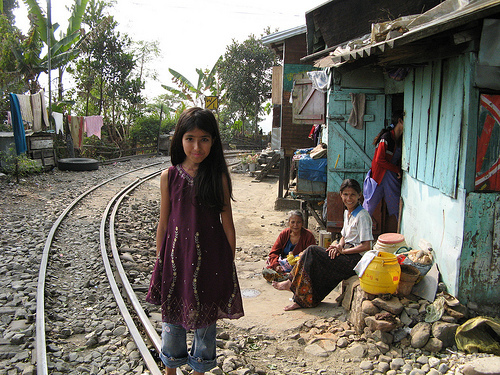 The next day we were back on the train early as it attempted to wind its way right up to Darjeeling before nightfall. This epic journey was only interrupted briefly by a pit stop in Kurseong (the highest railway station in India no less) before we moved on ever higher into the clouds. A full days train journey behind us and debarking at Darjeeling my first thought was that it was very cold, very cold indeed, freezing in fact. This was soon replaced by a second thought which came rushing into my thoughts the second I stopped internally complaining to take in the sights of the Darjeeling tea gardens growing on the slopes and the Himalayas behind. It was such a spectacular site that I almost forgot the cold, almost I say! With the sun setting and temperatures plummeting fast I made a beeline for the Old Bellevue Heritage Hotel, a beautiful old fashioned, Raj style hotel which, at only 9 euros a night, seemed like quite the bargain. The following morning I rose early to visit the Tibetan refugee camp. The place is more of a small town now than something you would associate with a camp given it’s a third generation development of fully brick built buildings. The Tibetans make a living selling beautiful carpets and rugs and small woven objects like wallets, spectacle cases, mobile phone case. A very friendly and warm people. With one final evening before my return to Siliguri and Calcutta I sat looking at the top of the world and soaking up what had been a fast paced whirlwind of colours and tastes. To travel between two such diverse places as Calcutta and Darjeeling in the same country and in the space of a few days left me wondering what more my Indian odyssey had in store for me. I couldn’t wait to find out. Guest post: Josh Aggars – Josh is a well published travel writer who combines his twin passions of surfing and travelling to explore the wider World. He sells mens flip flops to help fund his trips as he hurriedly files his latest copy for the Flip Flops City Surf blog.